Kingspan have over 60 years of experience in the wastewater management solutions industry, manufacturing septic tanks, sewage treatment plants, rainwater harvesting solutions and more. 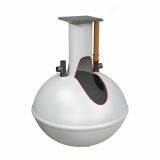 Here at Drainage Superstore we are proud to offer a range of Kingspan’s septic tanks, perfect to use when your property is not connected to mains sewage. Choose from a superior range of Kingspan septic tanks to suit a wide variety of projects, including 2800 litre tanks and 4600 litre versions. 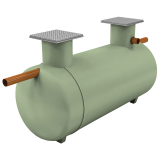 Clearwater alpha septic tanks are manufactured from high quality glass fibre, treating effluent that flows into it, whilst producing waste water that has been purified and cleaned to allow it to pass through a soakaway system. Choose from a traditional onion shaped septic tank, or a shallow dig septic tank which requires less soil digging, disposal and excavation costs.